*1Mars symbolizing the potential and Venus symbolizing the meaning are both in Scorpio, the sign of orientation and the survival of the species. *2 Pluto the symbol of orientation and the survival of the species is in Sagittarius, the sign of far reaching intellectual and real complex relationships. Jupiter in Leo means that the worldview is oriented onto the support of everything that is alive. *3 Sun in Capricorn either follows given standards or sets new ones. *4 Saturn and Mercury rule each other and thus symbolize a form of very crystallized and economic form of communication. 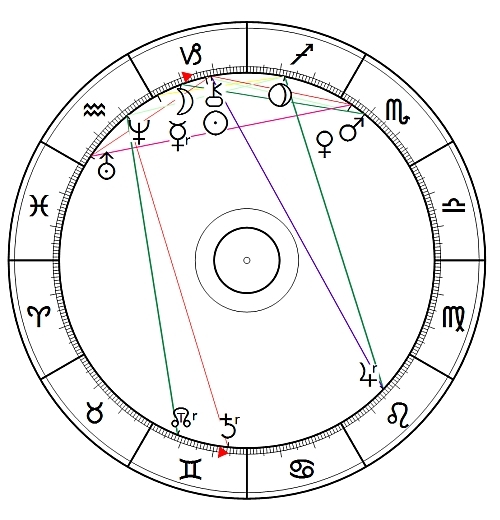 Neptune is in trine to the Moon Node and in a 135° angle to Saturn. *5 Sun in conjunct with Chiron in the middle of Uranus and Venus. Where did you get Greta Thunberg’s birth data? I haven’t been able to find it anywhere.